﻿ Fallen Timbers Battlefield Memorial Park - Ohio. Find It Here. Fallen Timbers Battlefield consists of 187 acres of open field with a wooded area near the center. The property, owned by Metroparks of the Toledo Area, is bounded on the east by Interstate 475, on the south by US Highway 24, on the west by a proposed retail/commercial development, and on the north by additional com-mercial property. The Fallen Timbers State Monument is a 9-acre site approximately 0.25 mile south of the battlefield. 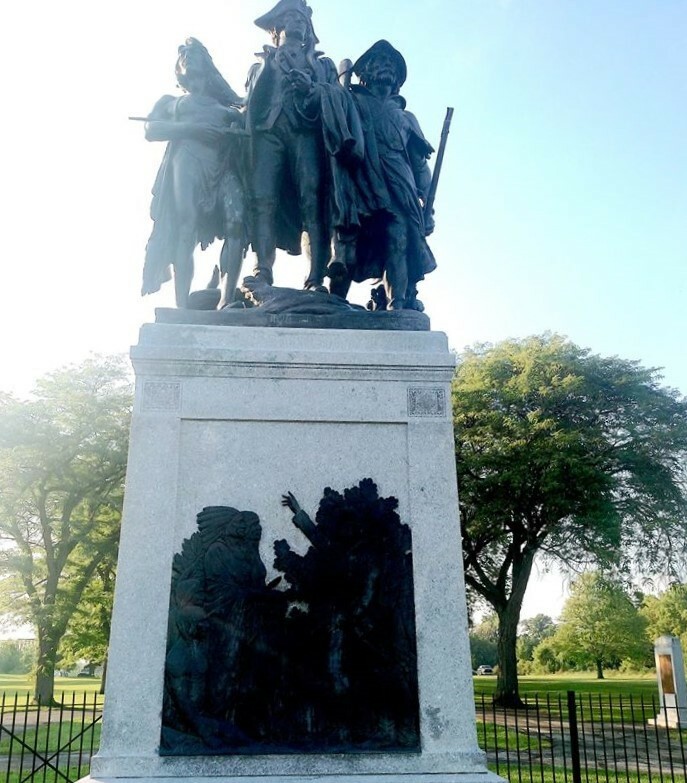 Listed as a National Historic Landmark, the monument is owned by the Ohio Historical Society and is managed by Metroparks of the toledo Area through an agreement.Monuments to the battle include the following: A 10-foot bronze statue of General Wayne, with an Indian guide to the right and a settler to the left, which is mounted on a 15-foot granite pedestal - As a National Historic Landmark, the monument has been found to possess exceptional value in commemorat-ing and illustrating the history of the United States. Two stone markers in front of the monument - One recognizes U.S. troops killed and wounded in the battle, and the other memorializes the Indian casualties. Turkeyfoot Rock - The rock is linked by Indian histories to the battle and was moved to the monument site in 1953 from its original location along the Maumee River. Based on conversations with representatives of the American Indian Intertribal Association, some individuals and groups continue to use Turkeyfoot Rock as the site of offerings and ceremonies.